Located about two hours from Washington, D.C., architect Jordan Goldstein’s retreat is series of stacked volumes comprised of granite, stucco and mahogany siding accents. The kitchen—outfitted with Porcelanosa cabinets and Krion surfaces—flows into the great room so the Goldstein family can easily spend time together. The lighting is by Flos and the dining table and chairs are from Cella Luxuria. A Samsung Smart Series television is recessed into the wall. Goldstein’s builder, Optiz Construction, customized the sliding door using Barn Door Hardware. 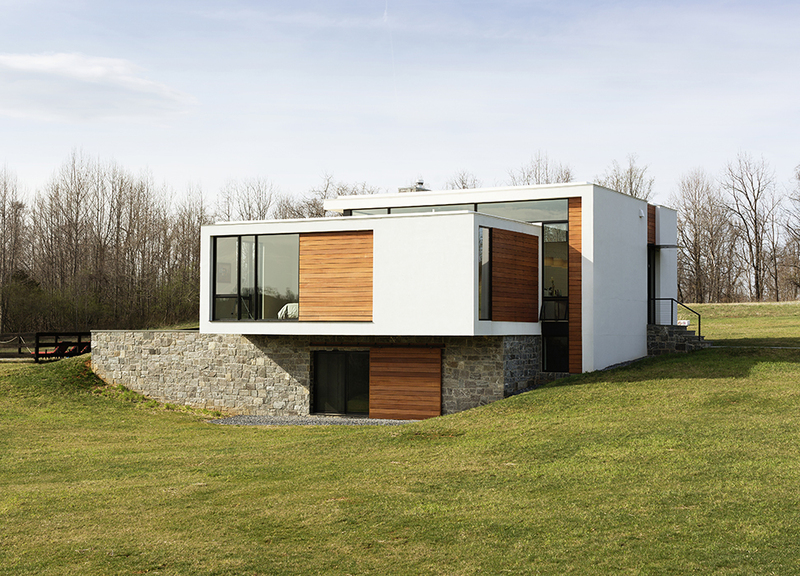 Let’s Get Technical: Problem-solving gadgets abound in the Rappahannock House’s design. Since the family frequently uses electronic devices, they opted for outlets that have USB connections, like the USB 15A Charger/Outlet by Hubbell Wiring Device-Kellems. The Pico Remote by Lutron is smaller than a deck of cards and operates the dimmable lighting in the great room. The family chose the Rhapsody Fireplace by Lennox for its clean look and because the temperature, flame height, and power can be remote controlled. In their years of trying to build a modern home in Washington D.C., architect Jordan Goldstein and his wife, Laurie, encountered ruthless bidding wars, restrictive zoning laws, and tiny lots. Then they looked beyond the Beltway. “Both my wife and I felt we should find a raw piece of land so we can start from scratch instead of dealing with constraints and existing infrastructure,” Goldstein explains. The Goldsteins discovered 23 acres of former farmland in Rappahannock County, Virginia, enveloped by rolling hills and forests. “The second we pulled up to the property, the first words out of my daughter’s mouth were, ‘This is awesome,’” Goldstein recalls. The 3,200-square-foot house offers plenty of space for Goldstein, Laurie, and their two daughters, Sari, nine, and Alexa, 13. Goldstein oriented the structure to the west to capture afternoon sun. The master suite is on one side of the living area and the two kids’ rooms on the other. A guest room and a media room occupy the basement level. Goldstein advocates discussing technology goals early on in the planning process. He and his wife prioritized seamless integration with the design. They also wanted the house to operate itself when the family is away. For example, the furnace turns off if it starts to operate inconsistently; a fire-suppression system recessed into the ceiling turns on automatically if it detects excess heat and smoke. Having reliable Internet service in a rural area was a challenge, so Goldstein factored that into his decision making. “It’s not like I can plug in FiOS because Verizon doesn’t run cable this far out,” he says. He discovered a home security company called SimpliSafe, which operates from a cellular network. From his mobile phone, Goldstein can monitor temperature, carbon-monoxide levels, smoke, and flood status (for leaks). All of the devices in the home communicate over a Local Area Network, a difficult system to penetrate and an extra layer of security for the family. “I can’t be there all the time, so how do I keep an eye on things and how do I, even when I’m there, still have the ability to understand what’s going on in different parts of the property?” he says. Because of his work as a commercial architect at a prominent firm, Goldstein is often privy to new product announcements. “I approached this as, let’s not just look at the residential items out there,” he says. “Let’s throw commercial products into the mix and develop a palette that feels right for this house.” He was familiar with Lutron and, after learning about the Caséta system before it officially came on the market, specified the wireless dimmer system to control the LED lighting—set to a warm color temperature. Goldstein researched both the Honeywell and Nest programmable thermostats, but preferred the latter because of its interface. The television is recessed into the living room wall and attached to a pivoting wall-mounted bracket so people in the kitchen can view what’s on the screen. Security cameras, with white housing virtually indistinguishable from the structure itself, help the Goldsteins keep an eye on things outside. An Apple AirPlay–based system provides audio throughout the property.